We are happy to announce that the recessive slate has now returned to the U.S. 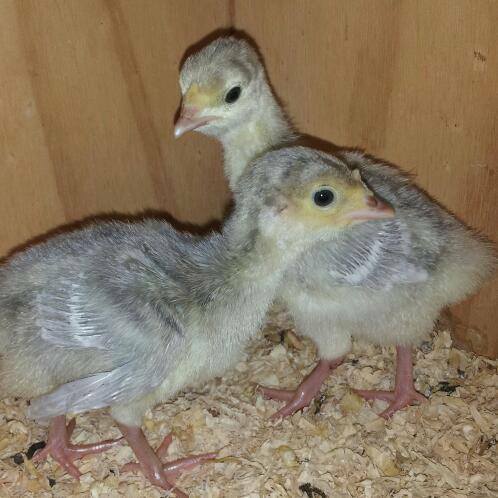 Thanks to Daryl Deutscher from Australia working with us thru all the red tape we were able to successfully import some fertilized eggs from him, we hatched out a few poults, got those raised up and were able to get them reproducing so we can now get these re-established in the U.S. once again. Contact us for more info. if interested in becoming a serious breeder of this variety. In 1936 V.S. Asmundson received two slate- colored hens from El Solyo Ranch in Vernalis, California which had been hatched out of their bronze breeding stock and had barring clearly indicated on the wings. It seemed best to use sl for this slate gene. These types of slates carrying the bronze color base gene have barred flight feathers and penciled tail feathers. 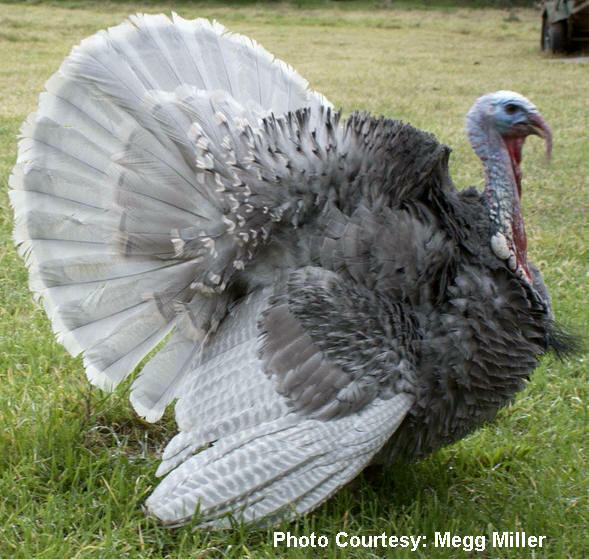 Two reports have been published dealing with the inheritance of slate color in the plumage of turkeys, one is a brief abstract of a paper presented by Robertson who reported that "'slate' differs from 'bronze' by a dominant diluter"; the other is a brief note by Taibel. 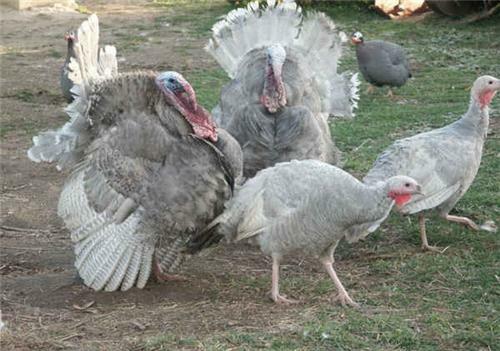 who obtained seven slate, four lilac and five bronze progeny from a pair of slate turkeys and concluded that slate turkeys are heterozygotes like Blue Andalusian chickens. In 1936 the El Solyo Ranch, Vernalis, California, kindly furnished me with two slate-colored hens which had been hatched out of their Bronze breeding stock, and had barring clearly indicated on the wings. These were mated, one to a Bronze male, the other to a Bourbon Red male. The plumage pattern genes involved in these crosses are : R (Bronze), r (Red), sl (slate) and SL (non-slate). The progeny of the Bronze male and slate female all had down and later plumage typical of the Bronze. The F2 generation comprised the down (and plumage) patterns shown in Table I. This is clearly a good approximation to a ratio of 3 Bronze to 1 slate expected if slate were a simple autosomal recessive to Bronze. The slate hen mated to a Bourbon Red male produced only a few progeny but these were of two types: Bronze and Fl pattern, the latter typical of crossbreds obtained when the Bronze and Bourbon Red varieties are crossed. Eggs laid for two weeks after the mating was made were discarded; but since subsequent experience agrees with that of others which indicates that a much longer period of not less than four weeks is desirable, it is almost certain that the Bronze progeny were out of a previous mating. A hybrid Bronze male was mated to two F1 females with Bronze and F1, patterns respectively. The results obtained are shown in Table II. Subsequent matings of Bourbon Red males with slate females or reciprocal matings have given either all F1, pattern progeny or Fl pattern and Bourbon Red pattern. The numbers of each kind obtained from the latter matings are: F1, pattern, 28 ? ?, 29 ? ? ; Bourbon Red pattern, 21 ?? 20 ? ? . Equal numbers are expected in each class while actually there was a deficiency of poults with red down. This may be due to lower viability of the red poults, caused by linkage of detrimental genes with the r gene, in the closely inbred Bourbon Reds which were used, or it may simply be the result of random sampling. The F1 pattern (RrSLsl) progeny out of the matings just described were mated inter se. The results are shown in Table III. The F1 pattern birds gave non-slate progeny which conformed to the expected ratio of 1 Bronze : 2 Fl pattern : 1 Bourbon Red pattern.' The slate progeny comprised birds that had barred flight feathers and penciled tail feathers and also birds with unbarred, nearly white, flight feathers and unpenciled slaty red tail feathers, some of which were white in the middle. The latter looked like birds that Taibel has called lilac. It should be emphasized that while the lilac colored birds differ in shade or color from other slates, they are, nevertheless, a slate-colored bird distinct from all non-slate birds. The Bourbon Red pattern birds out of slate mated with Bourbon Red gave only Bourbon Red and lilac (slate) progeny (Table III). The slates here reported have been mated to Black winged Bronze and Narragansett pattern birds and in each case the progeny were non-slates. The evidence presented in this paper leaves no doubt that the gene for slate is in this case recessive to non-slate. The exact shade and the distribution of color as shown in Figure 3, depends upon the genetic constitution of the individual. Since not enough information is available to consider this a dilution factor, it seems best to use sl for this slate gene rather than the D of Marsden and Martin until the claim of Robertson that there are dominant slates can be confirmed or refuted. The fact that our slates look like those seen at shows and elsewhere does not exclude the possibility that there are dominant and recessive genes determining phenotypically similar plumage patterns in the turkey just as there are such genes for white plumage color in chickens. There is nothing in our results to support the suggestion of Taibel that slates do not breed true although obviously slates of the constitution RrsIsl will produce a ratio of three slates with barred wings to one lilac. The effect of the R and r genes on the distribution of pigment is, therefore, the same in these slates as it is in non-slate individuals. The R gene is responsible for the production of black pigment, the r gene for brown pigment. Birds carrying the R gene have barred flight feathers and penciled main tail feathers; while birds homozygous for r lack barring and penciling in these sections. In both these effects the R gene is dominant to r; but since the heterozvgotes have lighter colored flight and main tail feathers than birds homozygous for R, they are readily distinguished from them at all stages as shown elsewhere. Slates of the constitution Rrsisi resemble those homozygous for R, but a careful study has not been made to determine whether they can be distinguished by examination. Slate-colored birds were mated to bronze, Bourbon Red, Black-winged bronze and Narragansetts. All the first generation progeny were non-slate regardless of which way the cross was made. Approximately three non-slate were obtained to each slate in the F2 generation. It is therefore concluded that slate is a simple autosomal recessive to non-slate. Slates carrying the Bronze color gene (R) have barred flight feathers and penciled tail feathers slates (lilac) homozygous for the Red gene (r) have nearly white, non-barred flight feathers and non-penciled tail feathers.